Because drybags are waterproof from the inside too, Ortlieb have fitted this one with a valve which allows it to function as a collapsible barrel with a tap. One end features a roll-and-clip closure so it can be filled easily from lakes and rivers, the other features Ortlieb's valve system which provides different sized openings for pouring, drinking, or attachment of accessories (not supplied). The drybag closure also makes it ideal for suspending from branches or vehicles: especially useful when you combine it with Ortlieb's shower adapter! 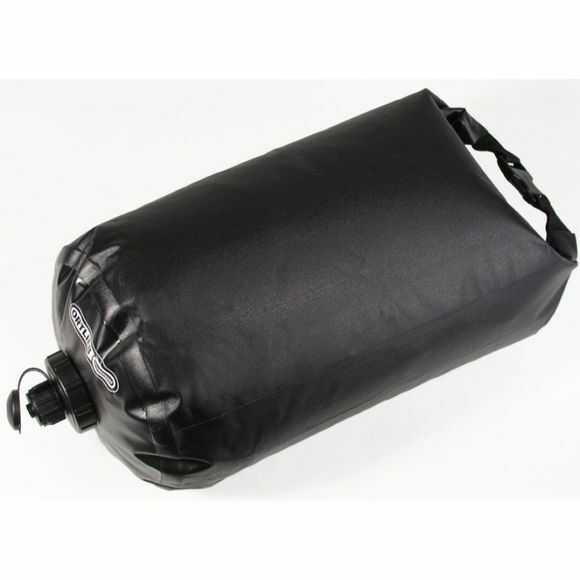 Of course, it can be used as a conventional drybag too, with the valve serving to purge spare air from inside: great for compressing bulky items such as clothes or sleeping bags.